Analysis: Ford's promotion comes on the heels of the Dolphins placing Jakeem Grant (Achilles) on injured reserve. The second-year wideout should provide the position with some added depth and will likely serve as a special teams contributor as well. Analysis: Ford seems to be over the shoulder injury he sustained in training camp, but the 2017 seventh-rounder still has work to do in order to make the final 53-man roster in Miami. His next chance to impress will come in next week's preseason game Saturday against the Ravens. Analysis: Ford's shoulder issue is unrelated to the meniscus injury which caused him to spend the entire 2017 season on injured reserve. 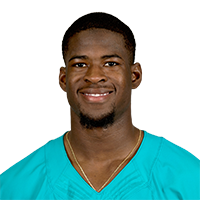 The 22-year-old will need to get healthy sooner rather than later, given that he's competing with Jakeem Grant and Leonte Carroo for the team's WR. 5 spot, and likely for a roster spot as well. Analysis: After spending all of 2017 on injured reserve due to a meniscus injury, Ford was expected to battle for a 53-man roster spot during training camp this season. He was indeed healthy for the offseason program, but his pursuit temporarily will be put on hold by an unrelated shoulder issue. Consider him day-to-day unless additional information reveals something more severe. Analysis: Ford racked up back-to-back, 1000-plus yard seasons in college before entering the NFL in 2017, but knee surgery derailed his entire rookie campaign. Head coach Adam Gase pointed out the improvements Ford has made while preparing for the 2018 season. Therefore, with a sixth wideout position up for grabs in Miami, the Virginia Tech product will be given every opportunity to take it. There are no videos available for Isaiah Ford. Click here to view all videos.